Update 11/08: Recovered photos have been added to this post. In a word: Quali-tea served with generoci-tea. Amanda, JM, Nichole, Sabi and Emo ate pretty much the whole menu - three tea sandwiches, a PBJ, a ham and mozzarella sandwich, a grownup rice bowl, a kiddie-sized rice bowl, some complementary cardamom cookies and donut muffins, three-for-the-price of-two chocolate truffles, a masala chai and an iced tea. The bill was about $40, or $8/person, plus tip. Amanda gave Ma-Cha an A-; JM gave Ma-Cha a B; Nichole gave Ma-Cha an A (see our grading rubric). 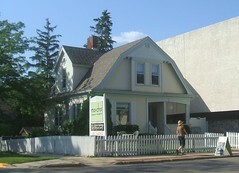 Ma-Cha is one of Madison's only dedicated tea houses, the other (that we're aware of, with another arriving this fall) being the Legacy House. While Legacy House is for white-gloved ladies, Ma-Cha is more Zen. It's undergone some reincarnations from co-op art gallery to its present form, and even on our visit we learned that the menu was changing. So, though we ate just about everything they had to offer, future visits may be uncharted territory. 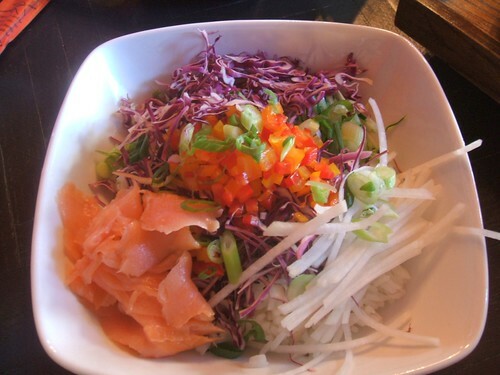 The atmosphere at Ma-Cha is very conducive to leisurely contemplation or conversation. Each separate room in the converted house, upstairs and down, has been outfitted with comfortable furniture or cushions and thoughtfully decorated in a different style and palette. We chose the large front room on the second floor, perfect for playing games with the kids or lounging on the floor to chat. Generosity marks Ma-Cha's service. We were treated to cookies and muffins as we waited for our sandwiches. The house-specialty cardamom cookies were tiny, light sugar cookies with a very subtle - nearly undetectable - spice flavor. Likewise, the "donut" muffins were OK but with a plain, ephemeral taste. Both made it easy to appreciate the bold spiciness of Nichole's masala chai, which started with a punch and tapered off into mellowness. The chai was served in a cast iron teapot with a diffuser, accompanied by a jug of whole milk (skim was also available) and a tiny dish to set the diffuser on when it had finished steeping. JM's ham and cheese sandwich was good, served on a quality bread, but wasn't anything more special than what's available elsewhere. At least there was something on the menu worth his eating, which is not always true at places like these. The tea sandwiches were excellent. A curried chicken salad with carrots on white bread was the least adventurous but most filling. The salmon was salty, with a good wasabi bite. Finally, the Asian pear with bleu cheese and sage on caraway rye was a complex array of interesting flavors. 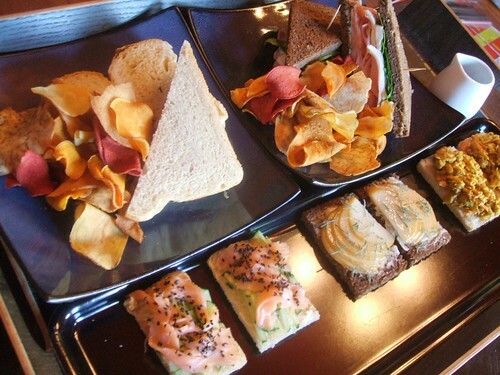 All the sandwiches, of course, were delicately presented with the crusts cut off. A more traditional PBJ proved its kid-friendliness, being deemed "very good" by Sabi. Neither she nor JM were particularly fond of the accompanying Terra vegetable chips, however, but that just left more for Amanda and Nichole. After dinner, Nichole ventured back downstairs to fetch chocolate truffles. She bought two, yet our host generously threw in a third. Ma-Cha offers a green tea truffle by David Bacco and a jasmine by Gail Ambrosius. The contrast in styles was striking. David Bacco's offering was sleek, square and shiny, with a green glitter glaze. The filling was (naturally) pistachio green and packed a strong matcha green tea punch. 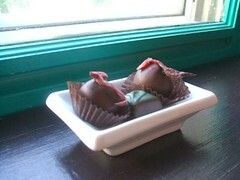 Gail Ambrosius' jasmine truffle, conversely, was velvety, curvy and topped with a dried jasmine petal. The melt-in-your-mouth filling seemed to say, "Would you like some tea with your chocolate?" rather than shouting, "TEA! I'm chocolate but I taste like TEA!" We think it's a gender thing. Amanda said she'd come back for the atmosphere, but the food was a bit too pricey for her to make it a regular spot. For those who'd walk a mile for a good cup of tea, the trip is well worth it, and they can bring their friends and kids as well. Two tea houses (more or less) in a row...crazy times. I like that they offer two very different styles of chocolates. Interesting that the two that are just down the road (in either direction) are foregone. I've really been intrigued by your blog for a while, and while not obsessed, I love it. Have commented only one time before, by a different name, probably. I am always intrigued by what you guys have to say about my fav places - this time, you guys have actually found a joint I'd never heard of. That's cool. Though I gotta say, JM orders ham and cheese with a lemonade everywhere he goes. He might be more favorable of more places if he ordered something else with a different (preferably alcoholic) drink. My partner orders 'shirmp with garlic butter' everywhere she goes, whether or not it serves 'shrimp with garlic butter.' To date, none are comparable to her own 'shrimp with garlic butter,' which includes simply pre-steamed and frozen tail-off shrimp, garlic POWDER, and butter. But thanks for expanding MY horizons. Awesome! I've been wondering about that place, and I think I need to stop in for the masala chai. @Kyle - poor Maurice's and James J do get overlooked. They're not even on the Eats list, a boon granted to only Gail so far as I can tell. (I'm all for more chocolate on the List. Better than more road trips for crummy fish fry, that's for sure). At Ale Asylum, JM ate the smoked ham and cheddar on wheat bread with chipotle mayo, lettuce, and tomato. At Alex Polish American Deli, JM had a garlic ham and cheese sandwich. At Allie B's, JM ate a ham, egg, and cheese breakfast bagel. At Argus, JM ate the "Exploding pig." At Artamos, JM ate a deluxe ham and cheddar sandwich. At Atlanta Bread Co., JM ate the honey maple ham sandwich, no cheese. At Babs' French Quarter Kitchen, JM ate the ham and cheese po' boy. At Bagels Forever, JM ate the ham-cheese breakfast bagel. At Baker's Too, JM ate a ham and cheddar sandwich. At Big Mike's Super Subs, JM ate a ham and cheese. At Branch St. Retreat, JM ate the hot ham and cheese. At Brasserie V, JM ate the croque monsieur. At Brocach Irish Pub, JM ate the ham and brie sandwich. At Cabana Room, JM ate the ham and cheese Cuban sandwich. At Caffe 608, JM ate the ham and bacon sandwich with a lemonade. At Cleveland's Diner, JM ate the ham, egg, and cheese muffin. At Coffee Gallerie, JM ate a ham sandwich. At Cousin's, JM ate the ham and cheese. At Creamery Cafe, JM ate the Albuquerque Melt. At Cuda Cafe, JM ate the grilled ham and cheese with a root beer. At Dancing Grounds, JM ate the ham and cheese sandwich. At Dexter's Pub, JM ate the Louie Luau burger (ham, pineapple and Swiss). At DP Dough, JM ate the cordon bleu zone. At Electric Earth, JM ate the hot ham and cheese sandwich. At Emian's European Bakery Deli, JM ate the ham and cheese croissant. At Espresso Royale Caffe, JM ate the ham and cheese sandwich. At Famous Dave's, JM ate the triple-smoked ham sandwich. At Francois' Bakery Cafe. JM ate the ham and cheese croissant. At Fromagination, JM ate the ham and cheese sandwich. At In the Company of Thieves, JM ate the ham and swiss panino. At Java Cat, JM ate the ham and swiss honey mustard panino. At Jimmy John's, JM ate the #1 (ham and provolone, lettuce, tomato, onion, mayo, vinegar on Italian). At Kelly's Grille, JM ate the Fitchburger (ham, swiss, and onion straws in addition to a massive slab of ground beef). At Lava Lounge, JM ate the grilled ham and cheese. At Locker Room, JM ate the grilled ham and cheese. At Ma-cha, JM ate the ham and mozzarella sandwich. That's 36 iterations of h&c (thanks, Google). And now, for the visually oriented. While you may not be obsessed, Bonz, I clearly am (as if you didn't know that already). Oh my goodness, too funny about all of the ham & cheese sandwiches! Your review is very timely. We were riding our bikes past Ma-Cha on Sunday and saw the board displaying a type of melon chill tea, which sounded great! No time to stop, although I will make a point to in the future. What I really love about this blog is that you take the initial awkwardness out of trying new places. I can get a feel for how the places operate in terms of ordering, etc. Keep up the great work! correction on the truffle macha offers from gail. i overheard(in line)it was exclusive and is infused with Lapsang Souchong(i hope i spelled it right).A very smoky tea and topped with a hibicus flower. 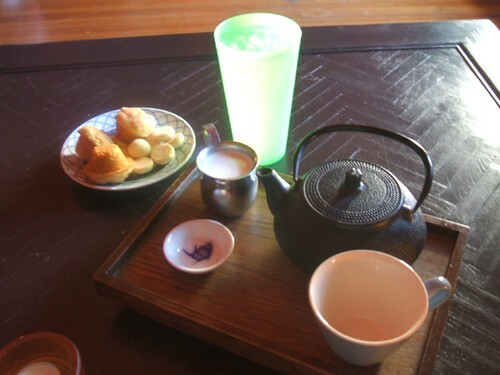 i love macha,so peaceful.they have awesome tea too. good blog. keep it up! Thanks for the correction! That's Sherlock's favorite tea, innit? As a regular customer, I have to say that Macha is a classic addition to Madison's eclectic vibe. The atmosphere is amazing, the selection is quite impressive, the service is excellent and it's got a great feel to it overall. Good news - our haunted photo card coughed up these Ma-Cha (and Mad City) pictures, finally. Enjoy.